What level of acoustics do I need? The sound is the oscillation of air pressure, which can be reflected, refracted or attenuated in the context of the room. Sound attenuation is the primary criterion when selecting the performance level of an indoor operable wall. Weighted sound reduction index expressed as Rw is used to measure the performance of partition. We manufactures a range of operable wall partitions that provide sound attenuation levels from Rw 30 dB to Rw 50 dB, where higher values ​​represent the upper limit of Sound attenuation based on laboratory tests. Do you manufacture operable wall or are you a dealer? We do not have to rely on a potentially unreliable supply chain. We can offer the most competitive prices on the market. We can be your operable wall supplier Philippines, and any other country. All operable walls are customized to suit for your project. Do you provide operable wall design services? In our technical team, we have experienced CAD technicians with many years experience of operable wall layout design. However, we don’t do 3d effect interior design. How do I support operable wall partitions in a building? 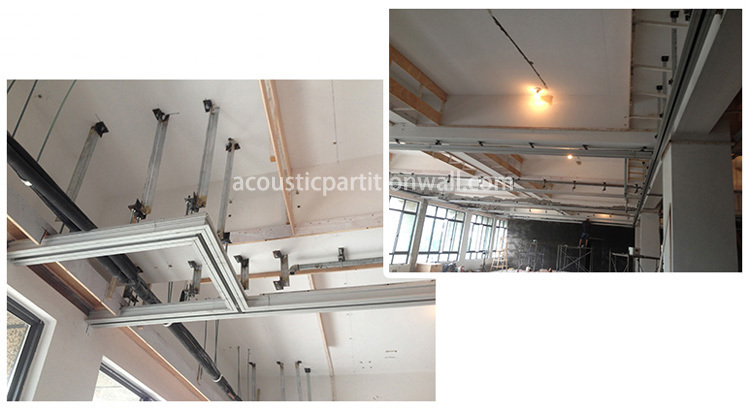 The operable partition wall is composed of a plurality of individual panels supported by an overhead track system. Due to the lack of floor support or rail, the overhead track supports the full loading of the operable wall. This is usually done by using pre-fabricated brackets which are secured to the structure at a pre-calculated interval according to the weight of the operable wall. The most common materials commonly used in overhead structures are steel or iron. Although we can advise on the loading density ​​of the operable wall and the weight of brackets used, the structural engineer of the scheme has a responsibility to determine whether the fixed structure is sufficient. Can you install and manufacture acoustic operable walls? We focus on design and manufacturing operable wall, but we don’t do installation. It’s not cost effective to send a team overseas to install. Local installers can be our partners. What surface treatments are available? The operable wall panel can be made in a number of options, the most popular surface treatment is melamine, laminates, wood veneer, paint and various wallpaper. However, it is also possible to accommodate a more professional surface treatment such as sound absorption panel and perforated board. The operable wall cost with different finishes is different. What is the level of sound insulation for operable wall in the field? In order to provide comparable noise levels, the operable walls are tested in an accredited laboratory with internationally recognized standards to determine the weighted sound reduction index dB Rw. It is important to understand that the specified dB Rw value is achieved under laboratory conditions by laboratory tests. Sound insulation is tested between two acoustically independent rooms, which means no sound leaks. On site soundproof partition wall conditions present further challenges in the shape of the abutments, vaults and floors, and sound will be propagated through this structure, known as flanking sound. This sound propagation structure has a noise reduction effect between adjacent areas other than laboratory test values. It is generally accepted that the on-site sound insulation test almost always results in lower results than the laboratory test level due to the infinite potential difference of the above-mentioned conditions. Negative differences between laboratory tests and actual field performance may also be affected by the addition of pass doors or vision panels within the operable wall structure.